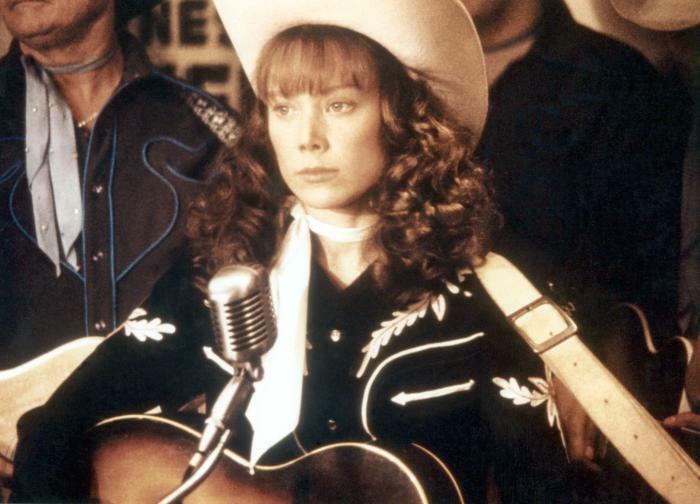 The story of Loretta Lynn's rise from deepest rural Kentucky to the top of the country music world, Coal Miner's Daughter is a clear-eyed story of success. 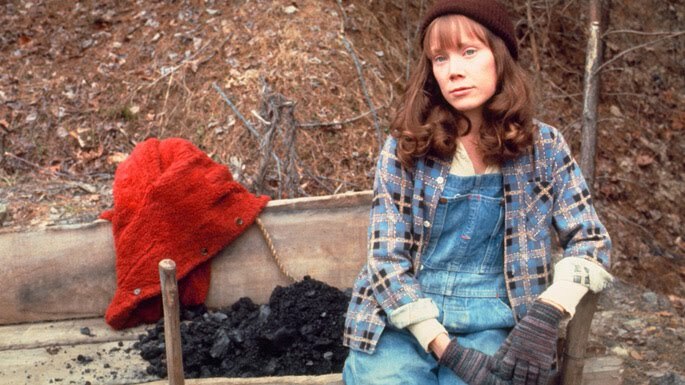 By boldly avoiding melodrama, director Michael Apted keeps the focus on the woman herself, and Sissy Spacek triumphantly delivers the performance of her career. It's the mid 1940s, and Loretta Webb (Spacek) lives with her seven siblings in the mining community of Butcher Hollow, Kentucky. Her father Ted (Levon Helm) works in the mines, and along with mom Clary (Phyllis Boyens) they do their best for their children. However, Ted and Clary are taken aback when Loretta, at around 14 years old, falls in love with the determined and resourceful Doolittle "Doo" Lynn (Tommy Lee Jones), a returning war veteran. They get married and Loretta is immediately pregnant. With Doo eager to escape the mines, they eventually relocate to Washington State. Loretta's family grows quickly and she is soon the young mother of four children. Doo, now working in forestry, gifts his wife a guitar to complement her natural singing talent. Deciding to take a crack at a singing career, and with Doo's strong support, Loretta starts to perform in local honky-tonks, before cutting a record and promoting it by physically barging into country music radio stations across Kentucky and Tennessee. Success follows, and with it a whole new set of challenges. Spacek is remarkable, embodying Lynn from a 14 year old innocent child in the barren minescape of Kentucky to the country music superstar in her mid thirties. Along the way to winning the Best Actress Academy Award, Spacek holds on to the heart of a strong-willed but charmingly candid woman as she navigates the decades, either maintaining her observant silence or unleashing a motormouth, the true country roots never abandoned by the world's biggest female country star. Making the performance more formidable, Spacek does all her own singing throughout Coal Miner's Daughter, adding a layer of seamless authenticity to the film. Tommy Lee Jones is just as engaging as Doolittle Lynn, receiving a Golden Globe nomination for capturing a complex personality instrumental in launching Loretta's career. Equally a supportive and disruptive influence in her life, the Tom Rickman screenplay (adapting Loretta's autobiography) hints at Doo's affairs and womanizing, but emphasizes his drive and dedication to see his wife succeed. Their relationship and marriage, which in real life lasted 38 years until his death, throbs at the heart of the film. In a relatively small but edgy role, Beverly D'Angelo plays Patsy Cline, who takes Lynn under her wing and partners with her for a powerhouse of a touring duo. D'Angelo also performed her own songs for the movie, and portrays Cline as a seasoned veteran of the country music scene, surveying the industry from the peak she helped to build for women singers. Apted allows the clothes, hairdos, and outfits of Coal Miner's Daughter do a lot of the talking, the passage of time moving softly and unobtrusively across the screen. Lynn's progress from a pregnant young girl to a still young but now confident mother of four toddlers is beautifully unveiled in a gem of a wordless scene set in Loretta's rural Washington kitchen. There are plenty of opportunities for histrionics, and Apted deftly avoids them all. The frequent tension between Loretta and Doo is kept at a grounded level of realism, both characters standing up for themselves and refusing to be victimized. Lynn has problems with painkillers and an emotional breakdown; Apted allows gestures and delicate touches to betray the mounting mental and physical tension, and steers clear of the cheap climactic emotional eruptions. The film ends with Loretta and Doo sparring over the design of a new house, a couple with a connection forged in the trenches of life and now strong enough to welcome robust poking. Coal Miner's Daughter is a commanding tale of love and success against the odds told with a breezy sensitivity, the artistic delivery of the material complementing the mine-hardened resolve of the subject matter.